Hi, Welcome to 1,000,000 Baseball Cards. 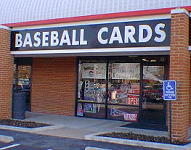 We are one of St. Louis� oldest and largest card shops. We opened our doors in 1989 and have been growing ever since. It�s taken years to get to this point, but we have virtually all of our singles inventory on this site for you to order. We have done mail order on cards for the last 16 years, and we are trying to convert our existing mail order customers to Web Site customers. If you are an existing customer, you know this was necessary because our complete baseball inventory now exceeds 60 typed pages with five columns per page. Football is close to 30 Pages, while Hockey and Basketball are 15 pages each. We have over 4,000 different people that have ordered from us over the 16 year period. We won�t be the cheapest source for cards nor the most expensive, but we will try to offer a wide range of current and old singles, stars and commons at a fair prices. We will do our best to ship your order promptly and will try to earn your repeat business. We carry a wide selection of Baseball, Football, Hockey and Basketball singles. We also carry unopened packs and boxes for modern issues. Our baseball selection includes a large variety of Vintage Singles, Modern singles and stars, Rookie Cards, Autographs, and Jersey cards. If you are ever in St. Louis, please stop in and see us in person.